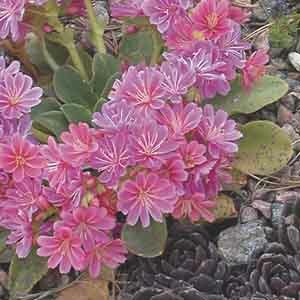 Lewisia species are native the Western North America and thrive when provided a planting site with excellent drainage. Most have a fairly long flowering period and some have evergreen foliage.Their upturned blooms bring a bit of color to more difficult gardening sites. Reliable plants for rock gardens and alpine troughs. Charming when tucked into rock crevices or walls. Perfect selection for filling in between paving stones. Tolerates poor soil, heat, and drought. Best if planted in gritty, sharply drained soil. Water regularly until established. Protect from excessive winter moisture.